Strangely, I’ve never really been into disaster films. Perhaps I just need a little personality added to the thing that is wrecking a city, or at the very least a face. When you get down to it there really isn’t much difference between something like, Twister (1996) or Godzilla (1954) aside from the fact that I know from which movie I’d rather have an action figure. Although come to think of it, if someone would make a movie where two tornadoes fight in the middle of a major metropolitan city, you would have my money. I went into Gorath originally thinking it would be a giant monster movie, this was not exactly the case. Gorath begins with a couple of young girls deciding to go for a late night swim when they are interrupted by a rocket launch. One of the girls, Tomoko Sonoda (Yumi Shirakawa), is reminded that her father is on that flight, which seems to be the kind of thing you’d remember. The crew of the JX-1 is on its way to study Saturn when they are ordered to divert course to an object reportedly six thousand times the mass of the Earth, yet invisible to any scans. That object is Gorath, a super dense meteor about three quarters the size of Earth and on a collision course. The JX-1 can’t escape the gravitational pull of Gorath and is destroyed. The world decides to send another expedition. There is also a plan to move the Earth out of the way, using giant rockets at the South Pole. 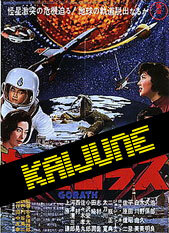 Enter goofball cadet Kanai (Akira Kubo) and his eagerness to try and get himself killed. Oh, and a giant prehistoric walrus shows up for about ten minutes to wreck some stuff. A few eccentricities aside, Gorath is a rote disaster film. There’s the seemingly unstoppable threat, dedicated scientists, and brash youngsters who get a lesson in loss after everything is done. It keeps things moving, and for the usually ponderous disaster movie genre, this one clocks in at a brief eighty-eight minutes. This is a Sixties Toho film directed by Ishirô Honda, so it has wonderful widescreen compositions along with a colorful palette and some excellent miniature work. There are a few weird moments in the film, notably a lengthy musical number sung by some young cadets as they commandeer a helicopter to plead with the head of the space agency to allow them go on a mission to Gorath. There’s also the prehistoric walrus that wakes up in Antarctica, wrecks a few buildings and is promptly killed. The thing looks as good as you could expect for a giant walrus costume, but on the whole, it feels out of place and kind of silly in the middle of some serious events. Reportedly the walrus was added to appeal to American audiences who responded so well to Godzilla, but it was cut from the American print after distributors just couldn't take it seriously. Even if disaster movies aren’t your thing, I’d give it a watch. It’s never dull, quite beautiful, and has enough odd moments to keep you engaged throughout its run.